Sports Scientist/ Pioneer & Founder of Special Olympics. 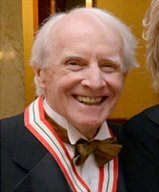 Dr. Hayden was born in Windsor in 1930. After becoming a Doctor of Philosophy at the University of Illinois, Hayden joined the faculty at Western University in 1964. In 1975, he became director of the School of Physical Education and Athletics at McMaster University, where he worked until his retirement in 1988. In early 1960 he began researching a fitness program for disabled children, and started developing sports programs designed for people with mental disabilities. In 1965 his research caught the attention of the Kennedy Foundation in Washington, DC. Dr. Hayden started to work alongside Eunice Kennedy Shriver (the co-founder of Special Olympics), and shared his beliefs that the power of sport can transform lives. Their collaboration led to the first Special Olympics 1968 in Chicago, IL, US. The first Special Olympics in Canada took place in June 1969 in Toronto with 1400 athletes from across the country. Dr. Hayden served as executive director of the Special Olympics from 1968-1972, and founded the European branch of the Special Olympics International. His work continued throughout the 1990’s as a consultant to the Canadian Special Olympics and his ideas were implemented in over 140 countries worldwide. In honor of his brilliant work and great accomplishments, Dr. Frank Hayden was inducted into Canada’s Sport Hall of Fame in 2016. “Dr, Frank Hayden”. Canada’s Sports Hall Of Fame. Web. Accessed 27 March 2018. Russel, Scott. “Special Olympics’ Dr. Frank Hayden transformed lives of millions”. CBC Sports. 01 November 2016. Web. Accessed 27 March 2018.